UNIFORMS AND FANTASIES exhibition now in Lyon at CASA LOLA featured in HETEROCLITE ! Uniforms and Fantasies exhibition at La Mine featured in the very hot Agenda Q magazine ! I’m very happy to be featured in WE ARE OBSCURED magazine with the UNIFORMS AND FANTASIES series ! Thank you Johann ! You made my day ! I’m very proud and honored to be featured in SATELLITE magazine for the UNIFORMS AND FANTASIES series. A thousand thanks to William for his kind and great support. You rock and you made my day dude ! UNIFORMS AND FANTASIES exhibition is now open at LA MINE until October 13 ! A thousand thanks to Greg, Jérôme and Sasha, the great team of La Mine, and the dearest FullMano for his so much precious help and advices for the installation ! You all guys rock ! 😉 I love you ! UNIFORMS AND FANTASIES featured in MISTER 10 ! Happy ! UNIFORMS AND FANTASIES featured in VANGUARDIST ! Happy ! 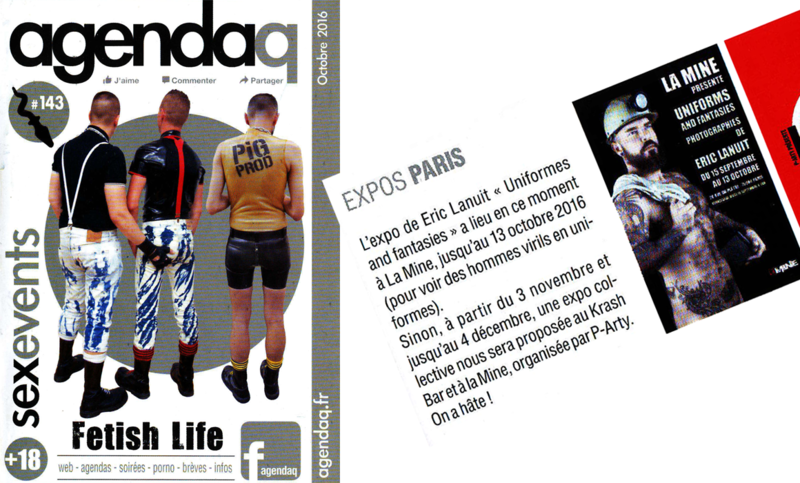 First press review in ADVOCATE about UNIFORMS AND FANTASIES exhibition to come next week in Paris at LA MINE. Happy and proud ! I have the pleasure to present you the teaser of UNIFORMS AND FANTASIES, my new exhibition that will be shown at LA MINE from September 15 to October 13. A thousand thanks to the amazingly great David for yesterday’s shooting ! Save the Date ! September 15th 2016 ! Exhibition’s opening at La Mine in Paris … More to come in August !